Laundry Soap. There must be a million recipes for homemade laundry soap out there. I know because I researched the topic a while back. Here’s mine, number a million-and-one. Grate one bar of Kirk’s Castile soap and one bar of Clearly Natural Glycerine soap. Bring 2 quarts of water almost to a boil. Turn off heat, add soap shreds, stir till dissolved. 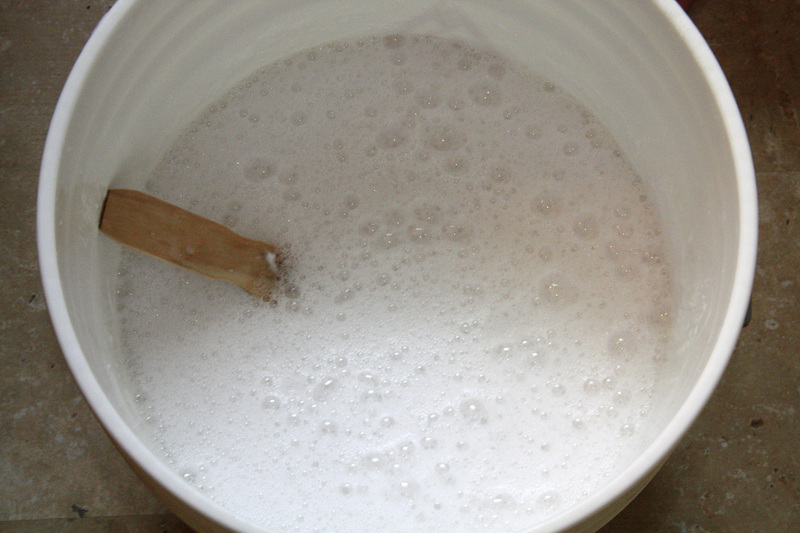 In a clean 5 gallon bucket, pour the hot soapy water. 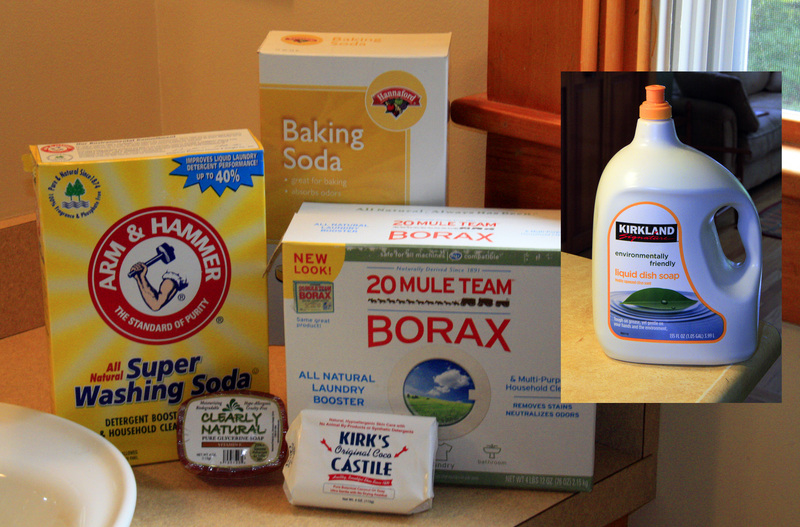 Add about 10 quarts of hot tap water and the following: 1 3/4 cups Borax, 1/2 cup washing soda, 1/2 cup baking soda, 3/4 cup liquid dish soap (omit this if your water is soft), and essential oils if desired. (Some people add 1/2 cup of Oxi Clean. I don’t find it necessary.) Stir very well with a paint stick or other clean utensil, making sure there aren’t any clumps at the bottom. Let sit overnight, stirring a few more times that day. The mixture will gel and may get very thick. The next day, use a sturdy utensil or your arm to break it up and mix it again. Transfer a small amount to a used laundry detergent bottle, shaking before each use, or keep a measuring cup near the bucket. Let the soap dissolve in the water before adding the clothes. Use about 1/2 to 1 cup per load (about 1/4 or 1/3 cup for “high efficiency” washers), and fill the liquid fabric softener cup with white vinegar every wash cycle. In the winter, use half a dryer sheet (in the dryer) to control static, but other fabric softeners shouldn’t be necessary. The clothes may not smell like anything when they come out… but that’s because they are clean. Enjoy! P.S. Do your towels and clothes smell “funky”? Try running a load with full hot water (no clothes, but as much hot water as your washer will hold) and 2 cups of bleach (less for a front-loading or high efficiency washer). Then switch to either homemade laundry soap or Charlie’s Soap (which really is the best laundry soap ever). Ta-da! The smell is gone after everything’s been washed a time or two.